Who as a child didn’t love their stacking toys? 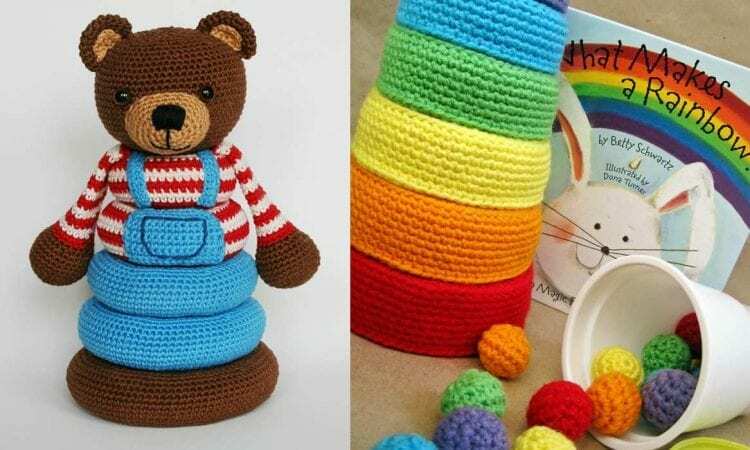 Well, the children in your life will simply adore these soft, stackable toys that are beautiful to look at, fun to play with and relatively easy to make. These toys, handmade with love, are relatively easy to make, and sure to be a hit with the young and old. We would like to show you 5 different patterns: the first 2 are paid, and the next 3 are free. Rainbow Bows – Free Crochet Pattern here. Stacking RIng Toy from Too Much Love – Free Crochet Pattern here. Pond Friends Stacking Toy – upper photo – starmunki/ Free Pattern is on Ravelry or here. I would really love to try these stackable animals. Can you please tell me how I can get hold of a pattern for those stacking animals please. Link to each pattern is under the photo. At the end of the post you can see – Click here to see free patterns – there are even more patterns. Do you have the stacking bunny in English please? Try the link under the photo – it should take you to English version of this pattern, if not you have to select the language directly on the pattern webpage in the right upper corner. I would love to buy this pattern, how much is it in Canadian money? How will I get it? Link to the patterns are at the end of the post. Few of them are totally free. I would like to buy the pattern of the stacking toy Bear.